Registered nurse Jody Hoppis wanted more time with her patients, and a schedule that would accommodate her life as a working mom of three. 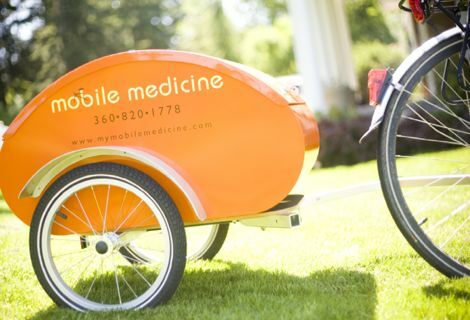 So she ditched her job at a family practice clinic and set up her own nursing practice called mymobilemedicine, of medical house calls made exclusively by electric bicycle. Photo stills courtesy Komo News. Hoppis bikes in a 15-mile radius around the town of Bellingham, Washington, making house calls to individual patients. Hoppis carries all of her equipment - a laptop computer and a "diagnostic bag" with stethoscope and blood pressure reader - in a custom-made bright orange bike trailer. It is modeled on a waterproof (and lockable) trailer used by Scottish postal carriers. Her Kalkhoff Pro Connect Sport e-bike provides a bit of extra power for making her rounds. Hoppis told the Bellingham Herald that her bike-based business cuts out a lot of the overhead of a regular office, and she can not only see patients quickly as they call or e-mail requesting a visit, but spend more time with them than a busy medical office. She makes nearly all of her patient visits by e-bike, and her Mobile Medicine web site spells out her medical philosophy, which is to treat patient symptoms, rather than just work from diagnostic tests. It's always great to see people expanding the role of bikes in making viable businesses.